X-rays were discovered by the German mechanical engineer and physicist Wilhelm Conrad Röntgen. On November 8, 1895 he stumbled on a previously unknown kind of ray while experimenting with Crookes tubes and Lenard tubes. Röntgen began studying this new type of radiation and on December 28, 1895, submitted his report “On a New Kind of Ray: A Preliminary Communication” to a scientific journal. 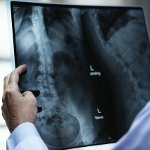 X-rays have a wide range of medical uses. They are primarily used for medical imaging (radiography, computer tomography, fluoroscopy) and radiation therapy of cancer. International Day of Radiology promotes the role of all forms of medical imaging in modern healthcare, while World Day of Radiography focuses on radiography. World Radiography Day was created in 2007 to raise public awareness of the role of radiographic imaging in the diagnosis and treatment of patients. It is celebrated by the Association of Radiographers of Nigeria, the Society of Radiographers (UK), the International Society of Radiographers and Radiological Technologists, and other professional organizations.